The golden lion-man came striding forward with flashing speed, great scimitars whipping out at Jihanna where she lolled against the wall. But even drunk, Jihanna’s reflexes held, and she dropped low to roll across the alleyway, staggering up against the opposite wall. Blades bit into stone, but Jihanna was gone again, whirling back into the alley’s gloom. The beast-man hissed and pursued. Jihanna frowned at that, and paused in her wild stumbling escape. She spun back to face her inhuman foe, her cutlass effortlessly leaping to her hand. With an uneven, drunken grin, she took a low guard and watched the thing slinking towards her. It raised one sword up high, striking for her head, but with a lightning move Jihanna brought her blade up to block. The other scimitar came swooping low for her forward leg, and although Jihanna was able to block the upper attack, she could only leap back to avoid the lower one. She tried to lunge forward, but two quick parries and a savage riposte drove her out, lucky not to have been wounded. Again the monster came forward, one sword high, one low, and again Jihanna had to retreat. Again her effort to counter-attack gained nothing. She risked a look behind her and saw the alley dead-ended in tall stone walls only a few feet back. There would not be room for much more of this game. Turning back to the creature, Jihanna planted her back foot, twisting her hips a little to set herself solidly in place. She held her blade out in front of her at first, staring at the thing before her, then lifted the tip up over her head, dropping it down behind her, her free hand instead held up before her face. The thing’s cat-like face managed to somehow form a sneer and it came forward in a feline rush. For a few seconds it was all Siu Wai and her monstrous opponent could do to hang on to the half-ruined carriage as it plunged down the steep street, careening in the wake of the stampeding beast up front. Wheels hammered on cobblestones and the city lights whirled around them. Siu Wai heard snatches of cries and calls from alongside, but her attention was firmly fixed on the silver-scaled thing before her. The draconic figure produced a long slim sword even as its other hand pulled the knife free of the seat, and took a steady guard position. Somehow the bouncing, leaping carriage seemed not to impede the beast’s calm readiness. Siu Wai stared, mouth hanging open, and only from sheerest instinct turned aside from her foe’s initial attack. She drew the Imperial blade at her side, a long double-edged straight sword of flexible steel, and was much better prepared for the next lunge. Blades clashed as she defended herself in the elegant Five Tigers style, crouching low on the seat cushions and trying to maintain her balance as the carriage continued its wild thundering course down through the city. They spun and leapt around each other, steel flickering between them, but Siu Wai could find no gap in her opponent’s form. His two blades kept coming at her, no matter how she blocked or counter-attacked. She thrust against his attacks, his long rapier blade shrieking along her edge, but that dagger came looping at her from below and all she could do was hurl herself sideways. Crashing into a seat cushion, bounced around by the carriage’s frantic motion, Siu Wai scrambled to get her feet under her, but before she could get back to a guard position he came at her again, and only by grabbing hold of one of the carriage box’ posts and hurling herself out over the rattling wheels could she avoid injury. Holding on to the post in one hand, her sword in the other, Siu Wai had an endless moment as she swung outwards, legs extended, aware of a slashing blade just missing her as she kept swinging, her whole body practically horizontal, circling around the post, and she pointed her toes like a gymnast as her trajectory brought her whipping around and back into the carriage directly behind her opponent. She lunged, perfectly positioned for the killing stroke of the Five Tigers style. But none of the Tigers were designed to deal with a bouncing, shivering carriage plunging down an unsteady street at full gallop. Her beautiful thrust went awry, and she found her tip stabbed deep into the panelling of the carriage as her foe twisted away, both blades raised up. Jihanna held her hand up in front of her, as though trying to hold back her oncoming enemy, until the creature lashed with its scimitars. Cutting for her hand, the two blades hissed through the air well in front of Jihanna as she yanked her hand back. She launched herself forward, into the space left behind the slashing blades. 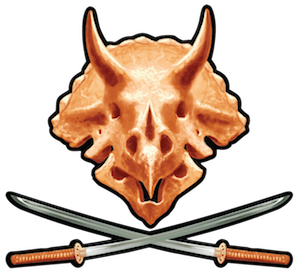 Her own sword arcing up and over from behind her, and she brought the heavy cutlass down in a two-handed chopping blow square on the gold-furred monster’s flat skull. A horrible hollow cracking sound filled the alleyway, and Jihanna and her monstrous opponent stood frozen for a second. Her blade sat deeply embedded in the thing’s head. No blood came from the terrible wound. For a moment massive golden arms spasmed, dropping both scimitars, and then the thing seemed to collapse in on itself, rolling up into a shimmering golden ball. It shrank further. In but a few breaths the enormous golden lion-man had vanished, and only a narrow circlet of gold and jade hung from her sword’s blade, looking like a giant’s earring. Jihanna gave her cutlass a shake and the bracelet fell to the slimy cobblestones in front of her. She poked at it with her swordtip and then flicked it off into the darkness of the alley edges. One quick check of her other jewelry and she sheathed her sword and strode back up out of the dark and into the brightly lit street. As the draconic figure slashed down with both rapier and poinard, Siu Wai did the only thing she could do: clinging to her swordhilt, she hurled herself out of the runaway carriage. The sword in her hand gave a lurch and Siu Wai winced as she dangled above the paving stones rushing by below, but the blade stayed embedded in the carriage’s body and she hung safely, bouncing with every jolt and trammel. Looking up she could see her enemy leaning out over the back of the carriage, rapier held ready to stab down at her. Siu Wai closed her eyes. She missed seeing the triumphant snarl on the creature’s face as it stabbed down at a sightless foe, but she did feel every bounce and bump with exquisite detail. And as the carriage rose up over a tilted paving stone, at the moment it hung weightless in the air, Siu Wai curled herself up, tucking her knees up into her chest, still clinging to her sword with one hand. The big dragonman’s thrust missed, and as the carriage crashed down, he staggered forward, leaning out dangerously. He might have recovered his balance, but Siu Wai arced and thrust both legs out, catching him on the back of his head with both her heels. His folded-up wings did not help him as he plunged face-first into the paving stones below. His neck cracked and his hideous features plowed into the stone, collapsing inwards. By the time Siu Wai had kicked herself up and into the carriage, all that was left of her foe was a silver-handled fan lying in the street. The slight Imperial girl lurched forward and found the leads of her carriage’s beast. With a few determined saws on the reins, and a steady series of business-like cries, she brought the half-destroyed carriage to a halt in front of a nondescript alley mouth just as Jihanna emerged. They both stared. Jihanna recovered first, with a smirking nod to Siu Wai’s half-open gown. Siu Wai hurriedly did up the clasps, raising an eyebrow down the alley her friend had just come out of. Jihanna climbed into the carriage, chuckling. She crashed down into the padded seat and gestured imperiously for them to move on. Siu Wai slapped the reins and then released them, collapsing next to her friend. The beast up front plodded forwards. Jihanna started a triumphant cackle, but looking back at the alley mouth receding behind them, she sighed. Far below, unseen, unknown, the two eyes of a great stone idol shed the last traces of gold and silver in strange metallic tears. Dust expelled outwards as stone lids levered shut. Nothing moved in the darkness. No voice emanated from any throat.